You’ve seen the signature black ovoid grille and the sweep of its LED headlight signature all over town. At first you wondered what it was, and you asked your car buddy to explain it. Now it’s a common sight around Santa Barbara, and you know that Tesla Motors is the first successful, fully electric vehicle brand in the world. Still, where do you buy one? 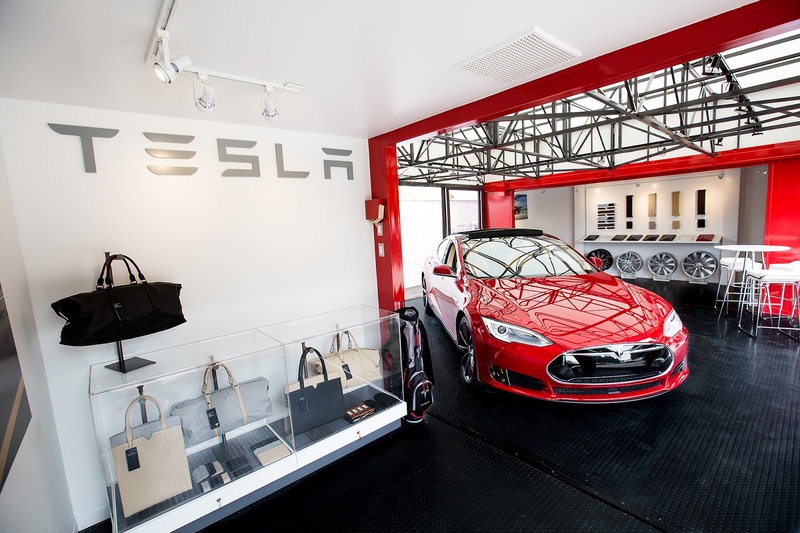 With Tesla’s rapid ascent as the premier brand of EVs, particularly in California, sometimes the retail presence lags a bit behind demand. While you can easily order a Model S online from the company’s website, you’d have to pick it up at the nearest store, which happens to be more than an hour away in Canoga Park, north of L.A. While California is by far the most important market to Tesla, its stores are still relatively tightly clustered around the Bay Area and L.A., with outposts in a few other upscale enclaves like Monterey and Palm Springs. The number-one underserved market for the brand is Santa Barbara. 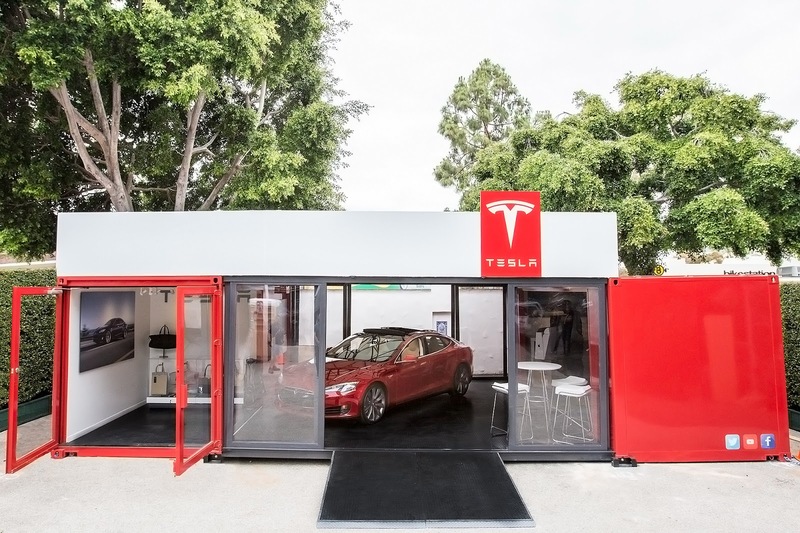 Which is why this is the location for the first Tesla pop-up store, here until late June, when it heads to its next stop in the Hamptons on Long Island, N.Y. People interested in the brand can experience the car, including a test drive, and see available color, upholstery and wheel options in the design center. And naturally, they can check out some Tesla-branded accessories, such as chic handbags. What they can’t do, though, is take one home that day. Every Tesla is still made to order, and the wait is currently about two months. According to Tesla, though, that fits well with their brand. “We’re here more to educate people about our cars than to sell them,” says Alexis Georgeson of Tesla communications. In fact, Tesla has made it a big part of their corporate mission to foster the EV ecosystem, even if it sometimes seems to go against their own interests; releasing their patents is a prime example, though it demonstrates that the company understands a strong brand can often be a more powerful competitive advantage than strong proprietary technology. Tesla’s lineup is currently limited to the Model S sedan, which starts at around $76,000, though federal and state tax incentives can take off up to $10,000 for many buyers. Tesla also shows another $10,000 in savings on its website based on “estimated gas savings over 5 years,” though this math has been criticized as highly variable, and the EPA puts this savings at between $5,000 and $5,500; still, by most accounts Tesla drivers have been very satisfied with the cost-benefit balance of owning or leasing their vehicles. I’ve driven Teslas before, and every experience has been positive. In my former position as an automotive forecaster, I had the chance to take a short road trip with a Model S, down to Santa Monica, and the need to return it with a reasonably full charge let me try out the company’s Supercharger facility in Oxnard. These chargers can give you a 170-mile top-off in just a half hour, and are strategically placed along travel corridors throughout the country to allow you to go just about anywhere in the lower 48 without fear of running out of juice. In fact, the company’s website map, showing its coverage, has few gaps, including West Texas (where they probably don’t take kindly to EVs, anyway), nearly the whole state of Arkansas, northern Michigan, and the northern edge of the Great Plains. There is a decent number of chargers around Santa Barbara, including in parking garages and store lots, with more going up all the time. And Tesla also has seven different “destination charging” spots between Goleta and Carp for use when customers stay at a sponsoring location, mostly high-end hotels such as the Canary and the Biltmore. The Canary says that they’d be happy to allow patrons of Finch & Fork to use their charger if it’s not needed by a hotel guest. The pop-up store happens to be just across the street from the Canary at 32 West Carrillo Street. When I stopped by, I was able to take out a P85D version of the Model S, the top vehicle in the lineup. When it comes to the S line, it’ll always have a two-digit indicator of the battery size in kWh, this one good for 253 miles of range, while the D indicates it’s a dual-motor model providing all- wheel drive. The P is the cherry on top, telling you it’s the Performance model, which can sprint to 60 mph in 3.1 seconds-in “Insane Mode”- faster than a Porsche 911 Turbo. We took a run up the 101, briefly experiencing the kidney-compressing acceleration of the car, and then headed up the Old San Marcos Pass to see how it handled changes in direction. At more than 4,600 pounds, the Model S is certainly no lightweight (it weighs around the same as a Mercedes S-Class), but its center of gravity is low due to its heavy batteries arranged in a flat platform along the bottom of the car. With this setup it has little problem handling tight curves, with just a bit of side-to-side motion in the more challenging sweeps. The torque is always there because of the nature of electric motors, so while you don’t get the same aural pleasure as when winding up a gas engine in the hills, it’s a fun experience nonetheless. The driving experience is also a bit different because of the regenerative braking setup. While many early EV efforts from established automakers focused on making the transition from gas seamless, Tesla is proud to emphasize what makes it different. So when you take your foot off the gas there is automatic braking, enabling you to drive almost with one pedal. The excellent new BMW i3 I recently drove has a similar setup. 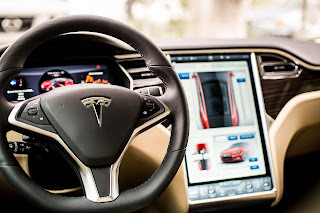 The functions of the car are all wrapped up in the central touch screen, which is intuitive and easy to use in the vein of Apple products – Tesla seems intent on being the Apple of automotive brands – and I only experienced one minor glitch in its function. In the context of most automotive infotainment systems, this is a pretty strong accomplishment. This vehicle starts at $106,200, but you can get above $130,000 when you fill it with options, like the autopilot function. You can go to their website to see leases and do your personal financial calculation. And then you can go to the pop-up store to experience the car for yourself. 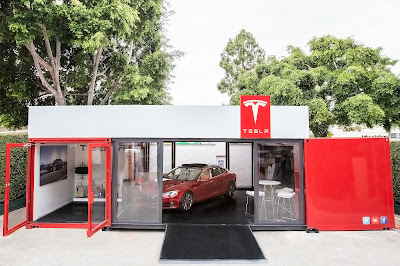 It will be in Santa Barbara until late June, open 11 am to 6 pm on weekdays (except Monday) and 11 to 8 on weekends, and by the end of the summer a full Tesla store is scheduled to open on Hitchcock Way. There are now plenty of electric car options on the market, and with the increases in charging infrastructure, especially in California, owning an EV is a much easier prospect than ever. But there are few brands that have such a fully developed electric ownership experience as Tesla.